John Babich signed his first contract in 1930 with the San Francisco Seals. The Seals sent him to Globe Arizona, and farmed him out to Tucson the following year. He came back to pitch in six games for the Seals when the Arizona Texas League folded. The next year the Seals offered John one hundred dollars a month or his release. John took his release. The Seals manager told John, "well you can't win in this league anyway." John signed with the Missions, went 20 and 15 for a last place team and he beat the Seals 8 or 9 times that year. He played in the majors for five years from 1934 to 1941. In '34 and '35 he pitched for the Brooklyn Dodgers. He pitched for the Boston Braves in 1936 for three games until his elbow gave out, Vince DiMaggio was his roommate and friend on that team. He finished his major league career with the Philadelphia A's in 1940 and 1941. His best year was in 1940 when he led the A's pitching staff with a 14-13 record for a last place team. The 1934 Brooklyn Dodgers was the first major league team that Casey Stengel managed and John was a part of it. The 21-year-old Babich pitched in 25 games winning seven and losing 11 with a 4.2 ERA. John said that one time when the team was in Chicago, he was hanging out in the lobby of one of Chicago's finer hotels, where the Dodgers were staying, with a few other rookies. Casey Stengel came by while they were talking baseball and proceeded to tell the players that they didn't know how to execute a proper hook slide. Casey was more than glad to demonstrate. I like the idea of these well-dressed rookies repeatedly running and practicing their sliding in a fine Chicago Hotel lobby while using a spittoon for a base. Once in the St Louis visitors clubhouse, Casey Stengel held a team meeting in which he went over the Cardinal hitters and how the Dodgers were going to pitch to them. At the end of the meeting, Stengel asked if anyone else had something to say. Dizzy Dean's voice popped up from the back of the big long room and shouted out, that's not the way I would pitch them. John Babich said that Dean then told the Dodgers how the Cards should be pitched to. Then Dean told the Dodgers how he was going to pitch them the next day, which he did and won the game. John was a pretty good hitter in the Pacific Coast League, but when John got to the Dodgers Casey Stengel told Babich, "you're just a pitcher, you're not a hitter. You better just learn how to bunt because that's all you're going to do. And John said you had to be a good bunter because if you weren't, you were out there the next day for two hours learning how to bunt." John was involved in pitching duels with Dizzy Dean, Bob Feller and Satchel Paige, among others. In 1940, Bob Feller beat John one to nothing twice. The Browns and Yankees beat him two zip. With a little more run support, John could have gone 18 and nine instead of 14 and 13. In 1935 Babich struck out Babe Ruth three times in one game. After the game Ruth asked John, "Hey kid, what was that you were throwing up there?" What John threw was a fastball and a natural slider. One of the big things I learned from John was that he rarely tried to throw his curve for a strike. "I'd just show it to them," John said many times to me. I didn't realize that there were pitchers who had pitches that were never intended to be a strike. John had great control. Ty Cobb once tried to change John's delivery, but he ignored Cobb because he knew it would ruin him. John had superb control. There was not one ballpark that John Babich did not like to pitch in. He liked Fenway because of the deep center field and he tried to get everybody to hit to Sam Chapman in centerfield. John said, "The green monster never bothered me at all because I never let them hit the ball to left field. You can make almost every hitter hit where you want them to, John said. At Fenway I'd pitch everything away from them. If you pitch inside, there's the monster up there. If I ever pitched inside, he would never get a good ball to hit because I would put the ball right up against his belly." John Babich increased my curiosity in the Pacific Coast League. He also pitched well for Hollywood, Seattle and Oakland in the PCL. John moved with the Missions to Hollywood in 1938 and won 19 games. Some of the actors who worked out with John when he was with Hollywood were Ronald Reagan, George Raft and Joe E. Brown. Brown wanted John to teach him how to throw a curve ball. John's response was, "Why would an old man like you want to know how to throw a curve ball? As a member of the Yankees organization he went 17-6 with the 1939 Kansas City team. The Philadelphia A's drafted John from the Yankees for the 1940 season. Five of John's 14 wins that year were against the Yankees. The last win knocked the Yankees out of the pennant race. After that game, Yankee manager Joe McCarthy ranted and raved in the Yankee clubhouse, yelling, "Babich, Babich, Babich. Who in the hell ever heard of Babich?" Yankee second baseman Joe Gordon responded, "Well, apparently our scouts didn't." By many accounts, John Babich had personally cost the Yankees the 1940 American League flag. In 1941, John pitched in two of the games during Joe DiMaggio's hitting streak. Babich was even part of DiMaggio's 61 game streak in the PCL in 1933 when Joe's base hit in the 19th game drove in a run and beat John and the Missions one zip. During the streak in 1941, John had told the press that if he got Joe D out the first time up, he would not give DiMaggio another pitch to hit and the streak would stop at 39 games. At Shibe park, Babich got DiMaggio to pop out to short his first time up. DiMaggio's second time up, John tried to pitch around him, throwing outside. DiMaggio reached across the plate on a 3-0 pitch and lined it to center for a double. Roger Angel in the New Yorker, and Richard Ben Cramer in the recent DiMaggio book, wrote that the ball DiMaggio hit went through John's legs, almost castrating him. John said that never happened, and he got a little annoyed when I first brought it up two years ago. The Yankees drafted John back from the A's in 1942 and sent him to Newark. Even though his arm was sore, he was having a great season with Newark going seven and 0 as the Sunday pitcher when his arm went bad. Bone chips froze up his elbow and put him in the Mayo Clinic. He came back and pitched again on Labor Day and finished out the season. It was written in his contract that the Yankees would pay his train fare back to California when the season was over. Still the Yankees balked at paying for his train ride back home. "I thought you guys were a class organization," John told the Yankees adding a few choice words. The Yankees finally paid for John to travel west, but only after John put up a fight. Those angry words came back to haunt him. When Casey Stengel was later named as the Yankees manager, his first choice to be pitching coach was John Babich. The Yankees wouldn't allow it. The Yankees refusal to honor that small provision in John's contract, and his insistence that they keep their word, kept John from being a part of the Yankee Championship teams of the fifties. 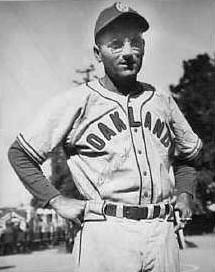 John was Casey's player coach at Oakland in 1946. In 1947, John managed Stockton in the California League and his team that year tied a record for consecutive wins with 26. Casey had tried to get John to leave the Stockton team in the middle of the '47 season to come back and coach the Oaks again. John had to tell Casey, "If I leave Stockton, the town will hang you and me both." In 1948 John returned to the Oaks, working for Casey as their pitching coach. That was the year the Oaks were the Pacific Coast League Champs with the nine old men, guys like Billy Raimondi, Dario Lodigiani, and Ernie Lombardi. A youngster named Billy Martin played second base. Casey started out the season coaching third base. But Casey had a habit of talking with the fans in the third base stands and forgetting about the runners so the players got John to take over at third. The Oaks used to travel to the games in San Diego and Seattle by train. John Babich and Casey Stengel would share a room in the train together. Many nights Casey would say to John, "We're going to stay up tonight and talk baseball." The first couple of times I met John, I thought he was fortunate to have had the chance to spend all that time on the trains with Casey Stengel. But the more I got to know John, the more I realized that Casey was the fortunate one. After John managed Idaho Falls in the Pioneer League in 1949, he got a good job delivering plumbing supplies. He spent time with his family, played golf, fished, nurtured friendships, planted excellent gardens and made the best beef jerky in the world. He had a lot of friends, because he was so positive and made people feel good for being around him. When Joe DiMaggio was nearing the end of his life, I asked John when he had last spoken to him. John said it was at an old timers game at Oakland in 1968. John put on a uniform and coached. Joe played. It was the last time John suited up. I asked John if it had occurred to him at the time that that might be the last time he might suit up, or if it was just another day of putting on a uniform. "It was just another uniform," John said. "I put on so many." John received a lot of autograph request in the mail and at occasional appearances. He never accepted money for an autograph. One guy from back east sent John 50 8 by 10 photos for him to sign and a fifty-dollar bill. John signed the photos and sent back the fifty-dollar bill with a note saying he did not accept money for signing. A while later the same guy sent him a one hundred dollar bill as a think you. John sent the hundred dollars back with another note saying he did not sign for money. In 1997, John was honored at a gathering of former Pacific Coast League Players for his years of excellent service to the league. John really enjoyed being with all of the former players, and the fans who showered him with fond attention. In 1999, I arranged for the Athletics to honor John by allowing him to throw out a first pitch before an A's Mariners game. John really enjoyed that too, even though he didn't like to go out to the games that much. Before the game John had a long chat with A's manager Art Howe. They talked for 15 - 20 minutes. Later I asked John what he and Howe talked about. John said, "Baseball, what else are we going to talk about." DON'T MISS AN INTERVIEW WITH JOHN BABICH. Copyright � 2001. William B. Shubb.